Today's Guardian publishes an op-ed by Hamad Bin Khalifa Bin Ahmed Al-Thani, president of the Qatar Football Association, in which he contends that Qatar deserved to host the 2022 World Cup. It's the sort of thing that begs you to scroll to the comments first, just to see the readers catalogue omissions and offer rebuttals, but let's look at the substance of Al-Thani's argument. 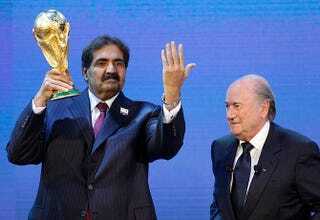 Qatar does not have a rich football history. We are a small country. Temperatures are high in the summer. However unfairly, our wealth alone fuels suspicions. But our bid succeeded not because these big questions were ignored but because we provided compelling answers. We turned each challenge to our advantage. We won because our bid was seen as the best. The heat of our summer is seen by some critics as the main reason why we could not possibly have won fair and square. But we showed how matches could be played and watched in comfortable conditions. I accept that we spent more money campaigning than other bids, but this was solely to catch up with our better known rivals. We had to tell people about our country and what we could offer, to overcome the perceived obstacles. But from the day we launched our bid to the day our country's name was pulled from the envelope in Zurich, we played strictly by the rules. We set out to Fifa how we wanted the World Cup to be a catalyst for positive change in our region. We have been as good as our word and have already taken steps, for instance, to modernise our labour laws. I'm not totally convinced. But I could be, for the right price.